The Coldwater Public Library began as the Ladies Library Association in 1870. Dr. John Henry Beech housed the library in the east parlors of his home until 1874, at which time he donated a small separate building. 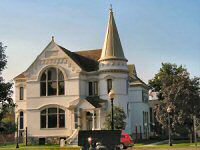 With the merger of the subscription Ladies Library Association and the Coldwater Public Library and Reading Room, the Coldwater Free Public Library was formed in 1881. At that time the city fathers had to push for a special "enabling act" in the state legislature so that the ladies could serve on the library board. Outgrowing the facilities, the library sought a new home. Edwin R. Clarke, one of Coldwater's leading merchants offered to build a library for the library. The library board, under the leadership of another of Coldwater's leading citizens, Henry Clay Lewis (whose wife Alma was the first president of the Ladies Library Association) undertook to do the job right. They consulted William F. Poole, then a librarian in the Chicago Public Library and a noted indexer, to design a functional library building. H.H. Parker, a local architect, translated Poole's design into a building that was highly functional as a library for its time. Construction was done by E. B. Saxon, and the building was dedicated on December 29, 1886. The Coldwater Public Library is one of the oldest libraries still functioning in its original building in the state of Michigan. Its architecture graces the four corner parks and dominates the central business district. The library is a Registered State Historic Site (No. 275) for the part that one of the early librarians, Mary A. Eddy, helped play in the founding of the Michigan Library Association. She became its first vice president in 1892. In 1974 the building was named a National Historic Site and became the cornerstone of the East Chicago Street Historic District. The library received one of the first Michigan Historic Preservation Grants in 1975. This was a matching grant and was used to restore the exterior of the building. Receipt of this grant gave impetus to the board to seek additional funds to enlarge and update the interior. The board worked closely with the Michigan Historical Division towards this goal. In 1978 the Coldwater Public Library merged with the Branch County Library to form the Branch County Library System, but the City of Coldwater retained ownership of the Edwin R. Clarke Building. The city received a federal grant of $780,000 and bonded for the remainder of the one million dollars necessary for a complete renovation of the building and a stylish addition which doubled its size. The project was awarded the Michigan society of Architects 1979 M Award for excellence in Masonry Design. The architectural firm of Graheck, Bell, Kline, and Brown of Traverse City and Marquette designed the addition and supervised renovation of the original structure. Today the building is headquarters for the Branch District Library System, which serves not only the people of Coldwater, but all of Branch County. The building is a symbol of the community's pride in its cultural heritage as well as its history of fine library service. It is indicative, too, of community efforts to preserve its many fine old public buildings and private residences.